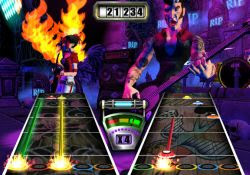 Activision has revealed new information regarding Guitar Hero 3 including tracks, online play, and wireless guitars. Activision made the announcement that the next Guitar Hero, Guitar Hero 3, will have original songs from groups such as the Rolling Stones, Beastie Boys, Tenacious D, Living Colour, and the Smashing Pumpkins. They also announced that the game will feature online play and wireless guitars. Here is the official track list thus far of the game that is set to release this fall for the holiday season. The report came during an earnings call.